Most people have foods that our traditional to have at Christmas. For my family there is a traditional breakfast. 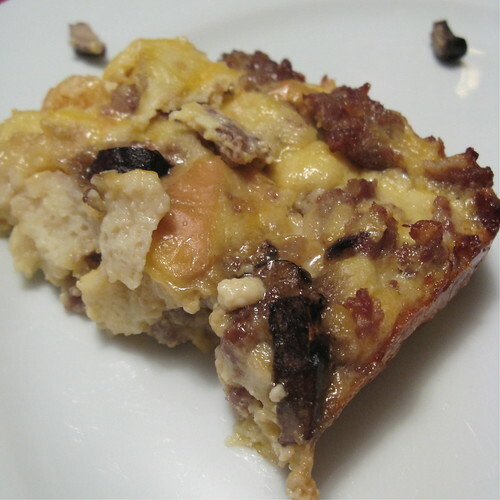 It basically must include two items, Sara Lee coffee cake & this breakfast casserole. The casserole is prepared ahead of time, usually on Christmas Eve, & is ready to pop in the oven Christmas morning. We get up, coffee is made & the casserole is put in the oven. Then we open our stocking gifts. When the stockings are empty its time for this hearty, hot breakfast before tackling the gifts under the tree. This casserole is dead simple to make, basically is a bread pudding with sausage in it, but it just tastes so good. Make a big pan of it because everyone will be going back for "just one more slice." Brown the sausage, drain any fat & cool. Beat eggs & milk. Add the salt & mustard & beat again. Add the bread and stir until it softens. Stir in cheese, mushrooms & sausage. Pour into a greased 9" x 13" pan. Refrigerate overnight. Bake the casserole for 40 - 45 minutes until golden brown & set. My MIL makes a killer breakfast casserole that it is now part of our Christmas tradition. Looking at yours makes me wish it was Christams already. We have German scones for Christmas morning. My husband looks forward to it all year! I want to try this for New Years, though. Okay, a new Christmas tradition begins at my house! Thanks for the recipe. We love a good breakfast casserole....especially on Christmas! Thanks for sharing. Simple but super yummy and perfect for crazy Christmas Morning! Happy Holidays to you and Matt! FOrget Christmas. I want that now. We're thinking of starting a similar thing as our Christmas tradition. An egg bake seems a great way to go, as they're tasty and you can make them the night before. I made this for Christmas. Thanks for the yummy recipe! Thank you for this recipe! My husband and I enjoyed it on our snow day! I made this on Christmas Day too (and once, since). But I used heavy cream instead of milk. (Hello, heart attack.) Sooooo good.